Hello my gorgeous readers. 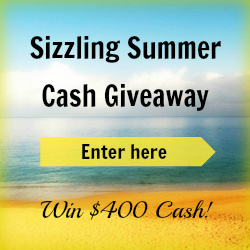 Today, not only do we have a fun blog hop to join in here, but you also have the opportunity to win $400. OMG! Imagine all the things that you could buy! Have you been saving up for a new camera to take better blog photos? Have you been lusting over a Michael Kors bag but just could not justify the purchase?